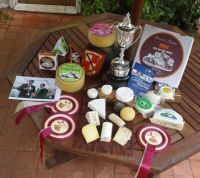 As an experience we took cheese to The Nantwich International cheese show in Cheshire UK in 2000.We won two 2nd's and a 3rd. We were thrilled as Nantwich advertises itself as the largest International cheese show in the world.Encouraged by this we entered again in 2002. We won the David Dunn Memorial Trophy for the best cheese board, and a further 2nd, 3rd and Commended.